She’s only been gone a couple of days, but I miss her, and we’ve all fallen in love with her. We had the great privilege last week, of hosting a lovely young lady from Japan, as part of an inter-school exchange program, in which our younger son is taking part. It’s a fantastic opportunity for him to go to that lovely country in the spring, and for all of us to learn a tiny bit about Japanese culture in the meantime. I have no idea what the composition of the chocolate coating is (part of the fun and mystery) as the ingredients on the box are in Japanese characters, but my sons adore them, as evidenced by the box of fifty, which is lying, empty and forlorn, amidst the gorgeous origami cranes, boats and shuriken (Ninja stars) we made while she was here. I have decided to have a go at making some “gourmet” Pockys from scratch, and in honour of our new Japanese friend, who took home a large sampling of our finest local chocolatiers’ wares, including Thomas Haas and Cocoa Nymph, I will coat my Pockys with some very nice milk chocolate. 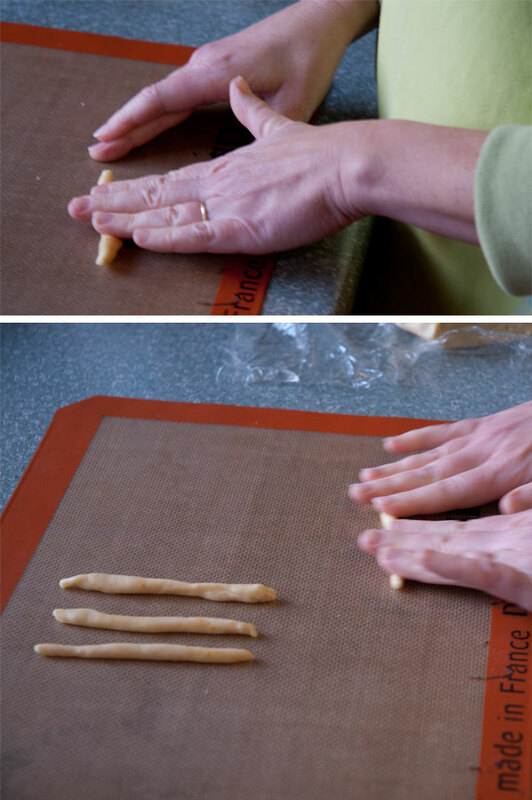 A quick search (I love the internet for things like this) and I find a recipe for the biscuit sticks at Not Quite Nigella’s website. I have learned much from Yoko this past week, including appreciating my city with new and delighted eyes (We loved hearing her say “Wow”), gratitude and reverence for the bounty and generosity of the earth’s food (and specifically my partner’s garden) and the beauty of small things. She described to me the tiny origami crane she was able to make, about 5mm in size, through patience and precise folds of a tiny piece of paper, as any overlap would create thick and clumsy layers. I will strive to make my Pockys tiny and precise. This is another good opportunity to practice enrobing, as I tend to “overcoat” everything with a thick pool of chocolate, leaving ribbons of excess around the bases. 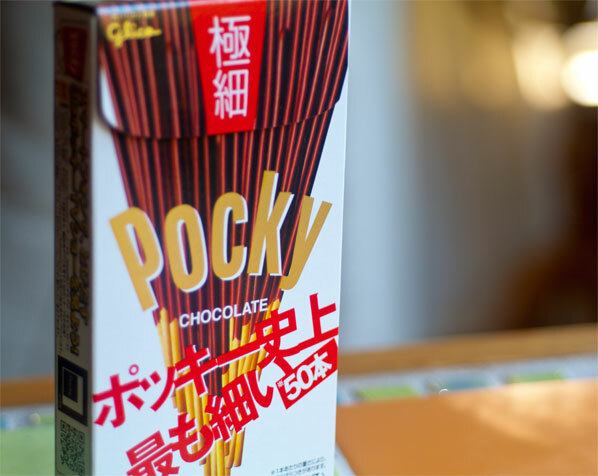 This will require careful tempering of a small amount of chocolate, and I will need a tall, thin container to ensure a clean “dip” of chocolate, which will coat the Pocky, leaving a small naked biscuit “handle”. The dough is surprisingly easy to work with, and smells heavenly, with a slight zest of orange (which leaves me sniffing my hands for the rest of the morning). It is quite like rolling plasticine and I find it very relaxing, especially when I pull up a stool and do it sitting down, measuring each one against a sterilized plastic ruler, to precisely ensure its correct length. I adjust the cooking time, checking to make sure they are thoroughly baked to the golden brown stage. In no time, the biscuits are ready, and I leave them to cool to room temperature – not a problem in our chilly fall weather. 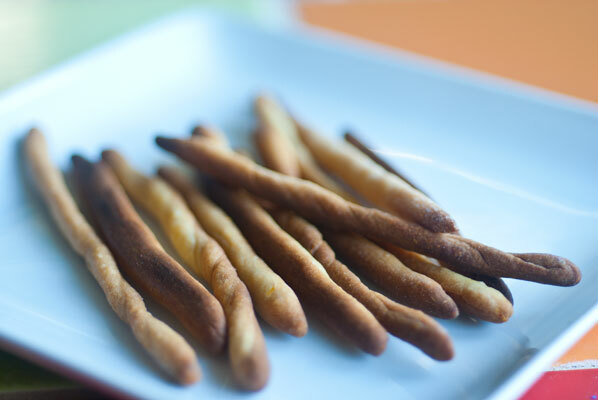 I am tempted to eat them “naked” as they smell so good, but remind myself they are not, in fact, Pockys without the coating, and the chocolate is waiting to be tempered. I was going to do a batch of dark chocolate first, but the aroma of orange reminds me how well milk chocolate goes with it, and I soon have a generous chunk of it grated to uniform size for seed tempering. I give the microwave oven a good sniff. This is always a tad risky in our house, as it is the appliance of choice for the boys and their friends’ lunches – usually involving something pungent like samosas or tacos. It smells fairly neutral (amazing what a good scouring with baking soda will do), so I set it on 50% power, put ¾ of my milk chocolate – oh, this Callebaut is good stuff – rich and caramelly as I lick shavings off my fingers – into a tall sturdy glass. I watch it carefully and manage to get it to the correct melting point, before adding in the seed chocolate. This also goes well. I stir until the chocolate is within the correct temperature range for forming the all-important V crystals, and then gently heat it again, to keep it in temper. Aha. The first biscuit goes into the tempered chocolate, I triumphantly pull it out, it looks perfect … and how can I possibly keep the chocolate in perfectly rounded form around the biscuit. As soon as I lay it on the Silpat mat, it will squash on one side. 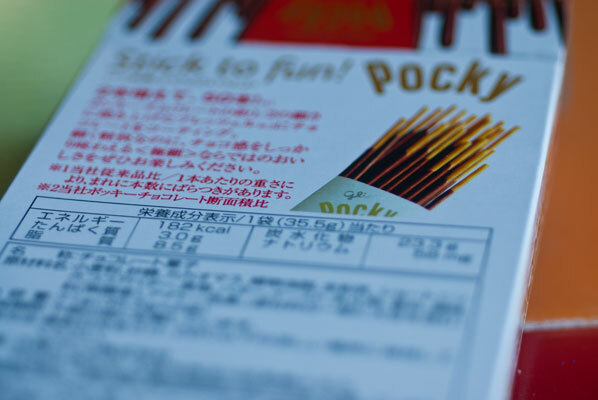 I should have thought of that before this moment, as I stand, Pocky in hand. Tiny and precise. Tiny and precise. Stay calm. Roll the plasticine. Plasticine. Plasticine. And then – I remember it. The Styrofoam ball we bought, when my son needed to create a model of a cell. We cut one wedge out of it, took one look at it, and it became obvious that Styrofoam was a poor choice for this model, and it was abandoned for plasticine. I paid a small fortune for that Styrofoam ball, from the art supply store, and was determined that it would find a use some day. It has been moving around our house for almost two years, but its day of glory has arrived at last! With my one free hand, I open the bedroom door, reach up into the cupboard where I last stored the Styrofoam ball, and bring it to the kitchen counter, to sit atop the Silpat mat. Having a wedge cut out of it makes it balance perfectly (I even use the cut out piece, reversed around and wedged back in, to stabilize it). 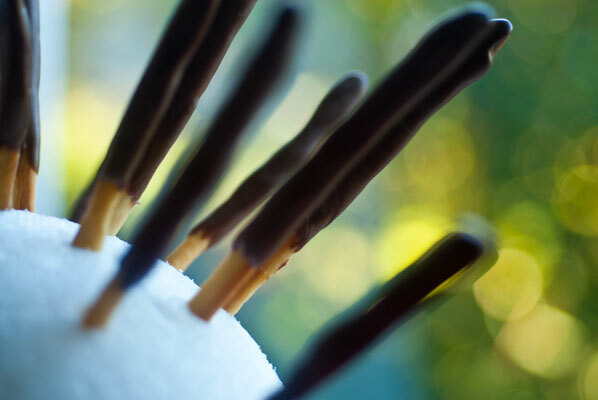 Not wanting to jam my fragile Pocky into the ball and perhaps break the end, I cast about for a tool to make a slender hole in the Styrofoam. 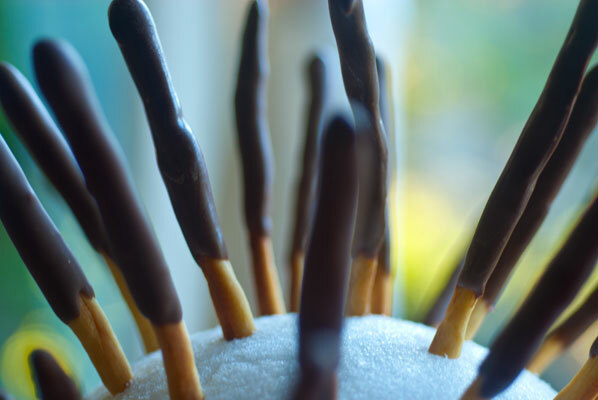 As though left there for just this purpose, my knitting bag seems to wave at me, and I grab one of my needles, jab a hole into the ball, and gently place the Chocolate enrobed Pocky stick into it. It is a little worse for the wear, and I probably should have just put this one down on the mat, and re-covered it, but it looks terrific. Kind of like a space probe in a satellite. It is a straightforward job to poke another bunch of holes into the Styrofoam, and very satisfying too, I must say. And soon I have a merry little collection of tiny chocolate coated biscuit sticks, sticking out of the Styrofoam ball like a many-legged insect. I wish Yoko could see this. I think it would make her laugh her wonderful laugh and say “Wow!” as she did so many times last week. It was wonderful to see our home through her eyes. And to learn so many things from her. 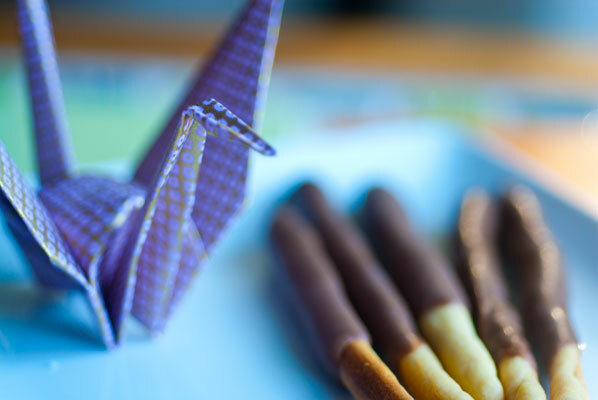 And while the chocolate is drying, I sit down and fold one tiny, perfect crane.